Prices include UK postage and packing. The Greyhound Gap collar makers search worldwide for beautiful trims for the collars that they make for the Rescue in a bid to bring you something a little out of the ordinary for your dogs and stock is forever changing so it's well worth popping back. The trims normally available will be a mixture of woven Jacquard trims and printed grosgrain ribbons. All Greyhound Gap collars are made using strong webbing, fully welded nickel plated hardware and use tri-bonded nylon threads to double stitch all stress points to ensure the safety of your dog at all times but, as with any collar, it is highly advisable to periodically check for signs of wear. Please note: These collars are intended for outdoor walks. If they are used indoors your dog may scratch at them pulling out threads on the trim. If used for walks only, they should last for years. It is also worth noting that trims made with metallic yarns are slightly more delicate so will need to be treated with care. 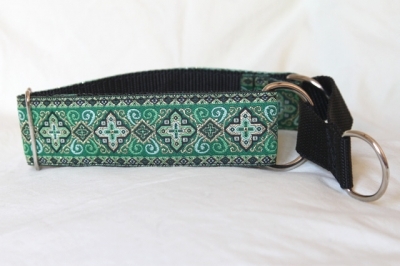 We strongly advise the use of a clip or tag collar around the home and not a martingale. All collars are suitable for either a machine wash at 30c or hand washing. If machine washing it is advisable to protect the trim from pulls by washing it inside a pillow case with the top tied and leave to dry naturally.